One of my new year's resolutions is to spend more quality time with my kids. Time when I'm not distracted, wanting to finish/start/design a new project, stressing out about paying bills, or dreading all the laundry/dishes/grocery shopping that needs to be done. I realize a lot of my impatience and snippiness with the kids occurs when they want my attention, but I'm trying to do something else. Which is like *all* the time. Multi-tasking is always touted as a great trait, but sometimes I think it's the pits. Why should I have to do sixteen things at once? Why can't I just enjoy my two sweeties and do absolutely nothing else? Grandmas get to do it, I want to, too. Over the weekend, I picked up this game at Target, off of one of their clearance shelves. At the risk of sounding like a commercial, I love it. 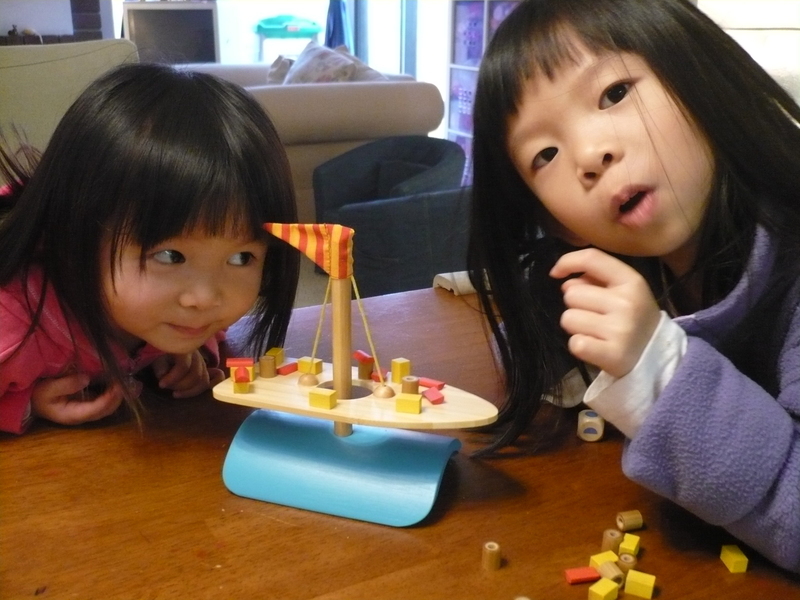 It's pretty, made of bamboo, simple rules, exciting, encourages imagination (Becca has to have a story to go with each object we add onto the boat), and fun. We had a great time, just playing, talking, enjoying each other's company. Best $4 I ever spent. Oh, and look, Mom. They both got haircuts! Bangs. I gave up on trying to grow them out, it just takes too dang long. Okay, for everyone else who isn't related to these two, I'll try to show something knitted, sewn, or otherwise crafty in my next post. That is an awesome game. We have a grandson who turns 5 in a few weeks, and I would love to find one....even better if I can find one at a Target on clearance! Thanks for the tip, Michelle! I like seeing crafty things, too, but I always enjoy seeing your girls. I just love the look on Jesse's face! I too would like to be able to focus on just one thing at a time! Kids or home or work or blog. Maybe in my next life. They look like they are having fun! What a wonderful "resolution". YEAH-why should mom's have to do 16 things at once, why can't they do just one! Sounds good. But grammas do have the knowledge that the girls will, at some point in the not too distant future, go home. That makes it easier. So don't be too hard on yourself if this resolution is hard to follow. It sure is for me! It is a struggle everyday. But worth it. That game does look fun - thanks for the recommendation.